On the lett-hand side of the Monlam Pavillion, beginning in the very first row, is a special section designated for the foreign sangha. 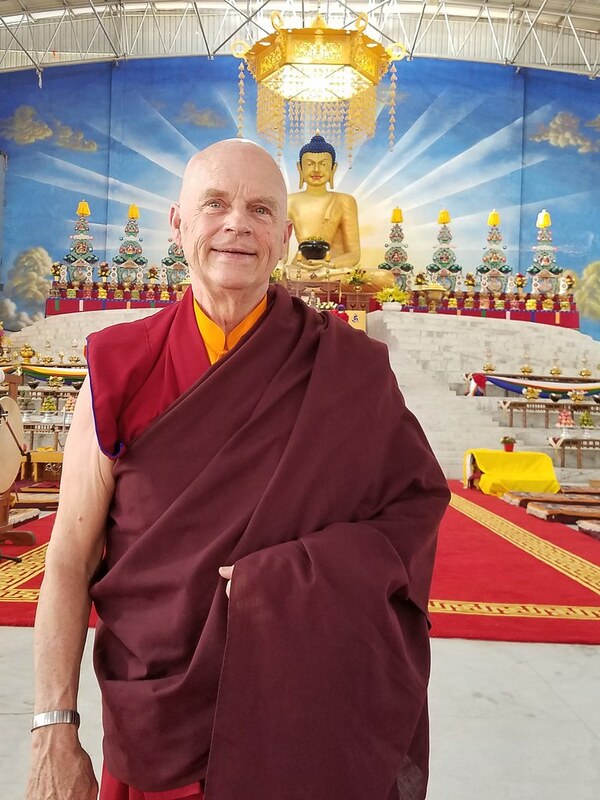 Although predominantly from traditionally Buddhist cultures in Asia— such as Korea, Taiwan, Vietnam and China—the seeds of the dharma are germinating slowly in the West and the number of western sangha is growing steadily. This year, for instance, a group of newly-ordained monks and nuns from Samye Ling in Scotland are attending for the first time. But for some of the western sangha, the roots of Dharma spread back many years and each year at the Monlam, you will find a scattering of long-established western monks and nuns. Some have been coming for years. Some have lived for long periods in India or Nepal, serving as English teachers and volunteers in the monasteries of their teachers. Most have endured significant hardship in pursuit of the dharma. Here are two of their stories. Tsultrim Yeshe, KTD, USA: Lama Yeshe, from Wisconsin, will celebrate 30 years in the dharma this April. In 1988, after practicing meditation for some months with an American student of Chogyam Trungpa Rinpoche, he heard that Khenpo Karthar Rinpoche would be in Chicago, so he traveled there to take refuge and was, in his words, “blown away.” He ran an upholstery shop for 17 years before entering three year retreat at Karme Ling (with Khenpo Karthar Rinpoche as retreat master) in 1993. While in retreat, he took monastic vows when His Eminence Tai Situ Rinpoche visited. Yeshe Lhamo, UK: Tsünma Yeshe entered the dharma in 1977, taking refuge with Chime Rinpoche in Suffolk, England. She has lived much of her life since that time in India, feeling that the values of western culture make dharma practice especially difficult in the West. Having wished for years to become a nun, she got her chance in 2012 and took monastic vows with His Eminence Tai Situ Rinpoche. She recounts that in her 40 years practicing dharma, there have been many obstacles, but she feels the blessings of her root guru, His Holiness the 17th Karmapa, very keenly. Both Lama Tsultrim Yeshe and Tsünma Yeshe Lhamo embody genuine renunciation. Unafraid of hardship, both are joyful and easy to be with. As the Sutra of the Recollection of the Three Jewels says, “The sangha of the Mahayana is engaged in goodness. It is worthy of joined palms. It is a fit object of generosity.” May these and all sangha members always have our support!